A BREATH OF FRESH AIR IN THE LOGISTICS SECTOR. IMT puts special emphasis on optimising processes and early detection and prompt correction of any defects. The same also holds true for the Schwarz Group which takes over a large part of the logistics activities and warehousing for Carl Zeiss IMT at their Aalen-Ebnat site. Two large warehouses of approx. 4,000 m² each and a height of approx. 9 m are used for interim storage of components. With stock moved on a daily basis, the stored components soon gather dust. There was a risk that problems would arise during further processing of the components. Carl Zeiss IMT also pays particular attention to occupational safety which also includes healthy indoor air quality in the storage areas. The availability of staff and maintaining their health is top priority. It was paramount for Carl Zeiss IMT, to find a safe, long-term solution that would cope effectively with large amounts of dust in large areas while using only a small amount of energy. This was the reason why Carl Zeiss IMT and the Schwarz logistics team decided to visit Camfil in order to inspect the operation of the prototype CamCleaner installation on site in the Ellwangen warehouse. The result was convincing, since significantly less dust was produced when CamCleaner air purifiers are used. The next step for a proper comparison was the testing phase. For 24 hours, test pallets loaded with clean room discs were stored simultaneously and in similar positions in the high-bay warehouse or in pick-up positions in the Camfil warehouse in Ellwangen and the IMT warehouse in Aalen-Ebnat. The particles on the clean room discs were counted afterwards. The result shows that dust accumulation in the logistics centre in Ellwangen, where Camfil air cleaners are in operation, is 3-4 times lower than in the warehouse in Aalen-Ebnat. The test proved the reliable operation of the air cleaner system. The logistics centre is now using Camfil CamCleaner 6000 units to clean the air in the areas used for storing IMT products. Prior to installing the units, particle concentrations were measured and the optimum positions and equipment types suitable for both warehouses were defined. The units are positioned to ensure proper airflow in the warehouse but at the same time do not get in the way of operations. The complete installation and commissioning of the system was carried out by Camfil. Particle measurement was carried out during commissioning. The result was that shortly after commissioning, particle accumulation (0.3 – 0.5 μm) in the warehouse was reduced by more than half. A second measurement, two weeks after commissioning, showed that the particle concentration was further reduced by half (only about 20% of the original particle concentration before the installation of the Camfil air cleaner). The logistics staff are more than happy with the increasingly dust-free storage area and the effects of improved working conditions. 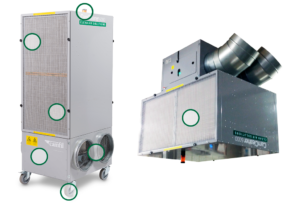 The highly-efficient air filtration system reduces the number of required air changes – which in turn reduces maintenance costs. Today, Carl Zeiss Industrielle Messtechnik GmbH (Carl Zeiss IMT) – a company of the Carl Zeiss Group – has three production sites and more than 100 sales and service centres worldwide. Carl Zeiss IMT is a technology leader for bridge-type and horizontal arm measuring machines as well as instruments for measuring form, geometry and surface. It sets high standards for everything from use in manufacturing environments to component storage, with special focus on quality, environmental protection and occupational safety. For more information visit Camfil’s website.